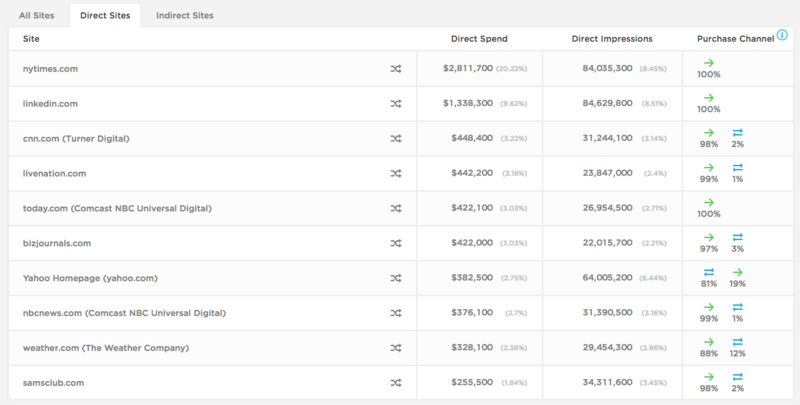 Banks and digital advertising: who’s spending what and where? Where do major US banks and FIs place their digital adverts and how much they spend on these? We look at the digital marketing habits of Citigroup, Capital One and Chase (data courtesy of Pathmatics). Capital One, Citigroup and Chase alone spent more than $168 million on desktop advertising in the first three quarters of 2016, according to Pathmatics data. What’s more, nearly 90% of spending between the three went to direct advertising, rather than through a trading desk, ad network or other advertising channel. This most likely means that 90% of these massive budgets was put directly into sites specifically selected by these ­advertisers. So where are these major banks directly placing their ad dollars? Where do they think they can get the best ROI? Capital One was the top financial services spender through Q3 of 2016 for desktop, doling out about $133 million. Most of the bank’s desktop advertising was through direct buys (at 93% of its total), compared to the industry average of 70% direct through Q3. The Yahoo homepage takes the top spot in advertising for Capital One with 46% of the company’s spend share, or more than $61 million. About 99% of this total spend is direct. In return, Capital One’s Yahoo ads get 52% of the bank’s ad impression share. Following Yahoo for the most spend is AOL.com (18%), MSN.com (15%), Amazon.com (10%) and ESPN.com (3%). 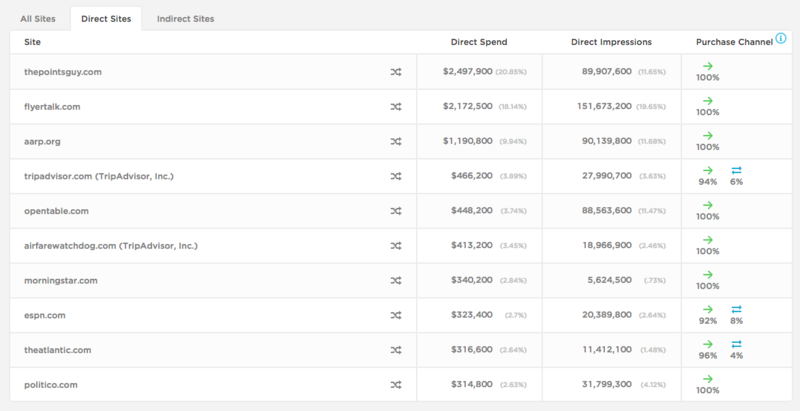 Capital One’s direct spending with Amazon.com, however, only reached about 60%. The remaining spend on the site is via ad networks. While Capital One was the top spender for the financial services sector through Q3, the next highest spending bank, Citigroup, was number 12 on the list. Still, Citigroup spent more than $18 million on desktop advertising. However, this is only about 2% of the sector’s spend share, compared to Capital One’s nearly 14%. While Citigroup didn’t put as much spend into direct as Capital One, the bank did allocate 76% of its desktop budget to direct. 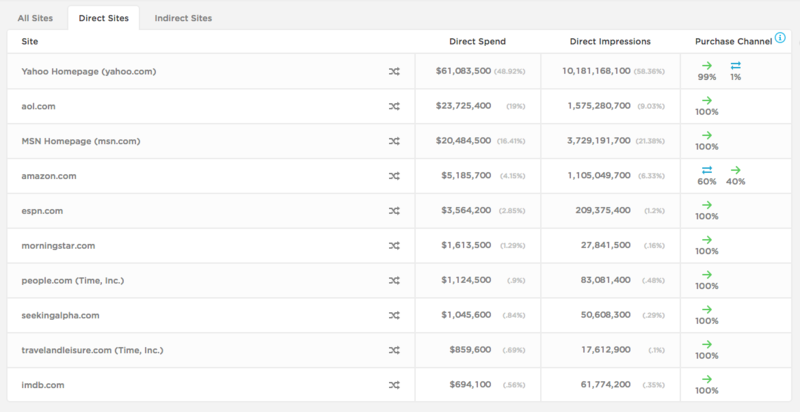 So what sites took the most direct spend dollars from Citigroup? The New York Times took 20% of Citigroup’s advertising budget, netting nearly $3 million. Following New York Times was LinkedIn.com (10%), CNN.com (3%), LiveNation.com (3%) and Today.com (3%). Chase was the 15th highest spender in the sector, just three positions below Citigroup. The bank spent $15 million on desktop advertising through Q3, with 77% of its spend going to direct advertising, similar to Citigroup’s direct spend allocation. While Citigroup and Chase had similar overall desktop, as well as desktop direct, advertising budgets, the banks’ selections of direct advertising sites were not as comparable. Chase’s top site for direct spend was ThePointsGuy.com, which took 21% of the bank’s spend share. Trailing were FlyerTalk.com (18%), AARP.org (10%), TripAdvisor.com (4%) and OpenTable.com (4%). While Citigroup appears to have favored news sites for its top direct advertisers, Chase gravitated more towards travel sites. Additionally, many of Chase’s top ads touted the bank’s travel rewards card, the United MileagePlus Explorer Card. California-based Pathmatics provides a digital advertising intelligence platform to advertisers, agencies, publishers, and ad tech providers. Chase is planning to launch a new self-service mortgage platform for its 43 million digital users, and will allow customers to digitally track their application – from start to finish. Capital One is introducing virtual assistant Eno, a chatbot that communicates with the bank’s customers via text messages. US firm acquires again and gets a comparison engine for online shoppers.